That thing I read yesterday? 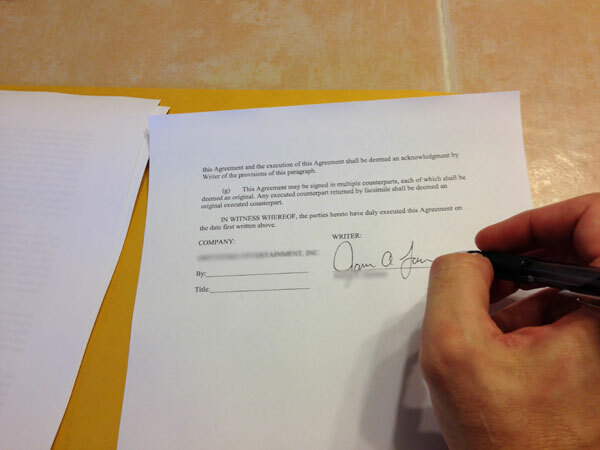 It was a contract with an entertainment company hiring me to write a TV movie based on an idea of mine. I can’t tell you what it’s about – that’s part of the contract – but I can say that it’s a romantic comedy that centers around a high school reunion and it’s hopefully lighthearted, fun, and funny. I have been paid for writing before. I made a (very) little money off of the two plays of mine that got produced here in LA and around the country; I got a little bit of dough out of a TV deal with a major company that never went anywhere; I’ve gotten some freelance type gigs to write or develop other people’s ideas; and of course there’s all the Vegas stuff. But this is the first time I have ever been hired to write a movie, from scratch, based on an idea that I had. I’m not getting paid very much money and there is absolutely no guarantee that the thing will ever get made, but still, it’s kinda cool and definitely different. 33 sit-ups, 90 crunches, 33 leg lifts, 1:35 plank.